As the Western half of the Roman Empire disintegrated, Roman emperors governing from Constantinople (Istanbul) in the East continued to hold sway for many years. This was also known as the Byzantine period in Greece and it lasted from 330-1453 AD. Christianity flourished during this period as Roman emperors ditched their Greek gods and embraced Jesus the martyr. A cultural revolution of sorts ensued. Byzantine art consisted almost solely of religious paintings and motifs made up of tiny pieces of mosaic. Gone were the sculptures made by artists who worshipped beauty in its most direct and naked form. Then, the Ottoman Turks invaded and were bent on converting the Greeks to Islam. So what did the Greeks do? 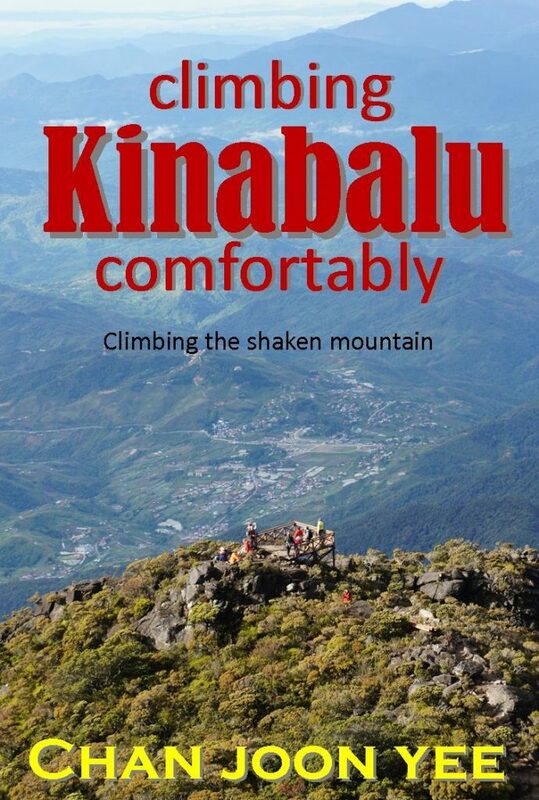 They fled to remote places and built their churches and monasteries in the most inaccessible places in the country. None of these hidden places of worship is more stunning than the monasteries at Meteora. Meteora was top on my list of things to see on this trip to Greece. In fact, it was the first place I went for after just one night in Athens. From pictures I’ve seen all over the web, these structures seem so surreal – as if they were created under orders of a director wishing to shoot a fantasy movie with a limitless budget. Meteoric is an adjective that refers to extraterrestrial bodies that hit the earth’s atmosphere and the location of these monasteries is so unbelievable that they seem to have descended from the sky. There is something pleasantly memorable about the taxi ride from our hotel to Bus Terminal B in Athens. The driver was probably the only honest taxi driver we met in Athens. He drove us to our destination for only €6. Speaking in passable English, he complained about the government, the economy and Greeks who are still supporting a socialist system. “One million people are unemployed!” he exclaimed. There are 10.8 million people in Greece. If we could understand Greek, I’m sure his ranting would have sounded even more colourful. At the bus terminal, described by various books as “drab”, “dingy”, I asked the very polite lady in the information booth which counter to get my tickets to Kalambaka. There wasn’t much English in the building, but I managed to get by. I went back to ask the lady at the information booth where the toilet was. She replied with a smile, dispelling all the gloom described by the books. Actually, the bus terminal wasn’t so drab or dingy compared to some of those in China. As for the buses, they were as sleek and comfortable as any long-distance coaches in the developed world. We didn’t have very long to wait. 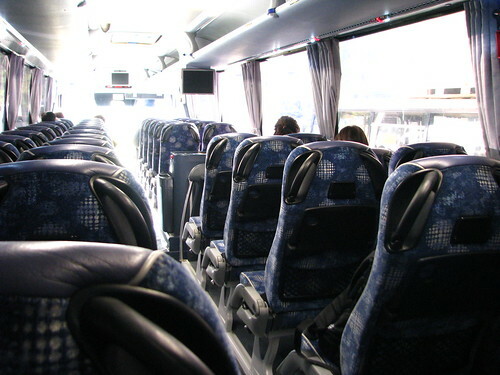 The bus departed punctually at 9.30am and the ride on the highway was smooth and comfortable. Our first rest stop came almost 3 hours later. I had to ask the driver for the duration of the stop and he replied that it was 10 minutes. We got down for a much needed toilet break. Like any rest stop on a highway, there was a restaurant and gift shop. A few of the passengers bought lunch and started wolfing it down at the tables. We had no appetite. The Greek countryside is beautiful. Every stretch displayed a different landscape. On one stretch, we would skirt around a lake. On another stretch we would careen close to the edge of the road overlooking a ravine with snow-clad mountains in the distance. One moment, we were surrounded by fields of olive trees and herds of sheep. Another moment, a dazzling field of solar panels greeted us. 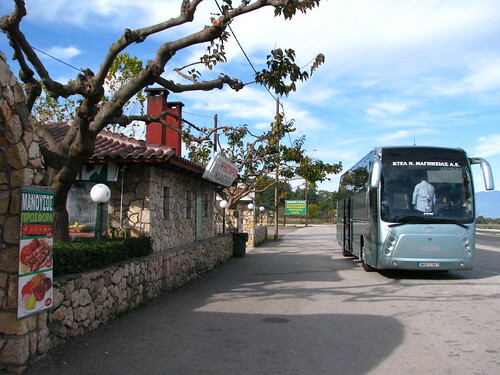 At about 2.00pm, we pulled into the remote but sophisticated bus terminal at Trikala. The driver told us to unload our luggage from the bus and change to the Kalambaka bus at bus bay No. 8. We waited there for almost 30 mins before the bus came. It was obviously a much older bus. The mystery of the bus terminal that looked even more sophisticated (albeit almost deserted) than the one in Athens was finally solved. Trikala is a bustling town with pharmacies, boutiques and a happening crowd lounging outside the colourful cafes. 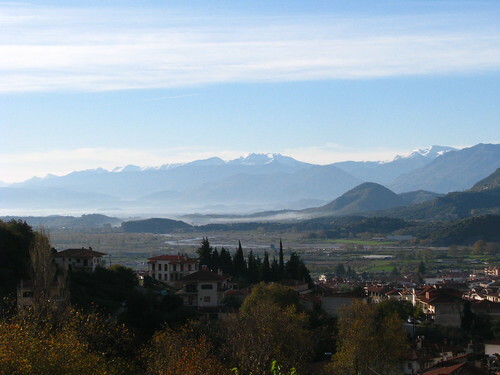 The bus wove through a housing estate in Trikala before it re-entered the highway, revealing wide expanses of flat plains in every direction, interrupted only by the Pindos Range in the west. Literally out of the blue and greenery, majestic towers of rock emerged. The first that caught my eye was an isolated table mountain of sorts. 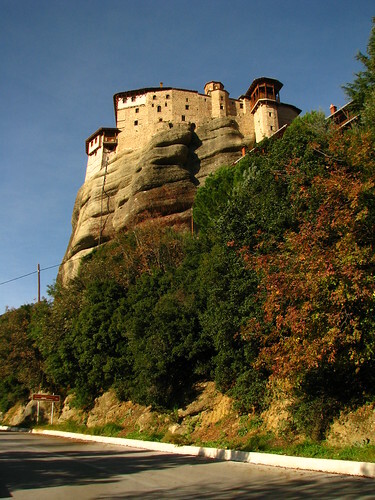 Further up, was the unmistakable Meteora complex with numerous houses dotted around the base like ants at a bird’s feet. One could only marvel at how random forces of nature could sculpt such magnificent works of art. The grey rocks, with their numerous bands, caves and cracks, suggest that the earth is a restless being capable of moving mountains, raising hills and shrugging off boulders without any regard for transient lifeforms. It was past 3.00pm when the bus pulled up next to the fountain. The unofficial taxi stand was just across the road with kiosks, cafes and bakeries to provide for the waiting drivers. After some confusion over which Hotel Meteora it was which I’ve booked on booking.com, we checked into the Hotel Meteora at Kalambaka (there’s another one of the same name in Kastraki) and went for a walk. 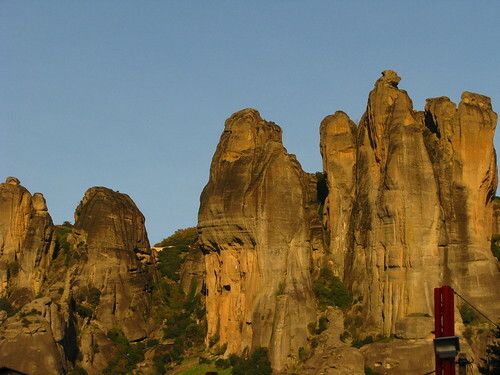 Even within the town itself, Meteora and its towering rocks looked menacingly beautiful. 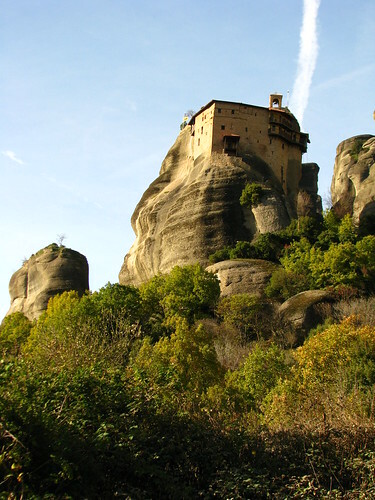 The monasteries perched on the top of these rock towers appeared so inaccessible, but there is actually a road that winds around the entire Meteora complex. Nevertheless, everyone agrees that it’s far more rewarding to walk/hike. Kalambaka was a small, simple but relatively modern town, albeit a rather sleepy, almost hibernating one thanks to the winter season. 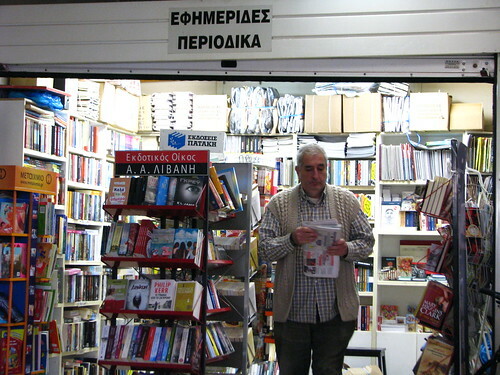 Many shops were closed, evidence that unlike Trikala, tourists are the lifeblood of Kalambaka. We had a simple dinner at a taverna. The little guy’s lips were cracking and swollen. I brought him to a pharmacy and got him some lip balm which I teasingly called “lipstick”. 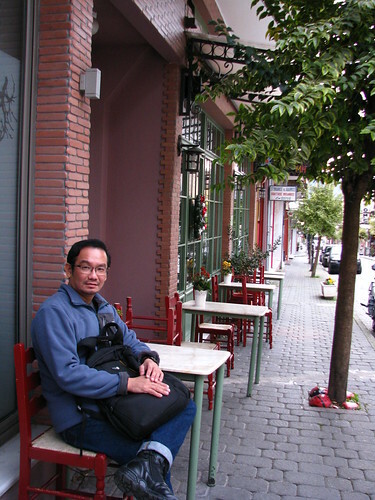 Unlike the pharmacies in Singapore, pharmacies in Greece are mostly sole proprietorships proudly run by families and individuals. The pharmacists confidently dispense drugs after a somewhat informal consultation with their customers. This makes them a little like our neighbourhood GPs. Patients on long-term medication can buy several months’ supply without prescriptions. One month’s supply of hypertensive medication amlodipine for instance, costs only €6. We had a simple dinner of chicken fillet and hamburger “steak”. Several old men were seated at the taverna, nursing their tiny cups of Greek coffee. They spoke no English but listened intently to our conversation with the restaurant owner. When we left, they waved and managed to say “bye Singapore”. As for weather conditions, Kalambaka was considerably colder than Athens. Our hotel room was situated directly beneath a huge rock and that practically screened us from any warming effect from the sun in that direction. For only €41 a night, the hotel was a very friendly, homely place run by a family, but they were not very generous with the heating. We had no control over it and the hot water and heating are only turned on at about 6-7 in the evening. It’s difficult to go back to sleep if you wake up in the middle of the night to discover that they’ve turned off the heating. We got ready for Meteora at 7 the next morning. The sun was just rising and the owner of Meteora Hotel, Dimitris was preparing our breakfast. It was our first truly Greek meal with mezes, olives, bread, tomato salad, feta cheese and meat wrapped in grape leaves. After breakfast, Dimitris opened a map of the area and gave us directions. The estimated distance for the hike was 20km and Dimitris said that he expected to see us back at about 5pm. Happily, we went on our way. It was a cold but sunny morning. The sky was clear with hardly a cloud to be seen. We located the Koka Roka Taverna as Dimitris had advised and we ran into several dead ends before we found the right path meandering in a ravine between two huge rocks. It was a pretty easy climb to the “top” where a well-maintained and virtually flat road wove its way around the monasteries. The rugged landscape used to deter the Turks. Now, there’s easy access even for slothful tourists. A long flight of stone stairs started from the entrance to Agios Trias which has the most spectacular perch of all the monasteries. It was from this vertical tower of rock that James Bond (Roger Moore) or rather his stunt double, nearly fell off. Back in reality, a bearded monk informed me to come back on Friday. 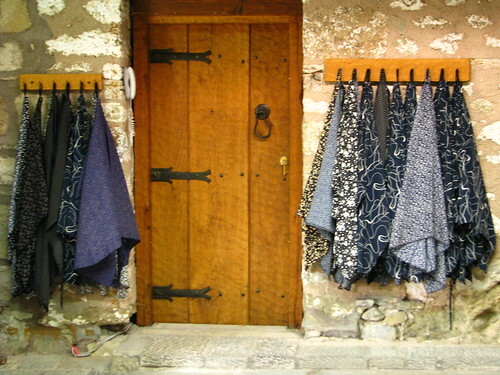 Yes, like many of the shops, offices and businesses in Greece, monasteries are not open every day. A siesta a day and a few rest days a week, especially in winter, keep the doctor away. The cobblestone road arched upwards to a tarmac road which makes all the monasteries accessible to tour buses. 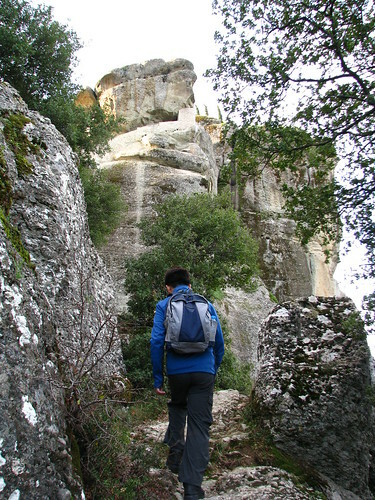 It was an easy and comfortable walk to Agios Stephanos (Saint Stephen’s Monastery). Below is a picture of the ticket you’ll have to buy to enter. Like the temples in Thailand, there is a dress code here. No shorts, no sleeveless shirts. For women, no shorts, short skirts and even if you wear pants, you must cover up with a long skirt. The enclosed spaces within these monasteries bear few signs of age. 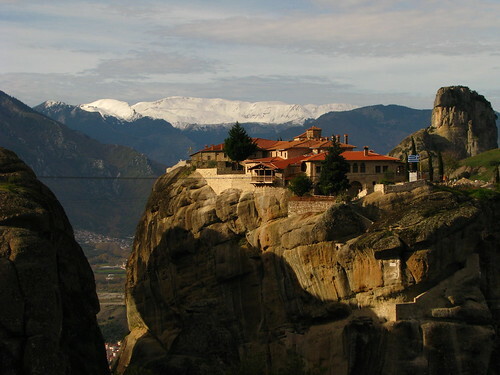 Unlike other inland regions in Greece, Meteora still sees some tourists in winter. The interior of the church shows the piety of the Greeks. At first glance, I almost mistook Greek Orthodoxy for Catholicism due to their practice of iconography, the veneration of Mother of God and the presence of confession boxes. The most persuasive part of their teachings lie in the fact that the New Testament was originally written in Greek and the bibles in the museum here, some encased in intricately constructed metal frames, bear a deep sense of authenticity. Nevertheless, the extent of the influence of the Byzantine Empire results in many followers of Orthodoxy today worshipping in Russian and even Arabic. Far from being relegated to history, Saint Stephenos, as well as some other monasteries in Meteora, are still alive and breathing, albeit in a modern atmosphere. I was most impressed by the fine works of art inside the “central church” or Katholikon. In the sacred chamber, there were very meticulously painted murals – Byzantine art kept alive by faith and immense effort that rival those of the builders on this precipitous terrain. 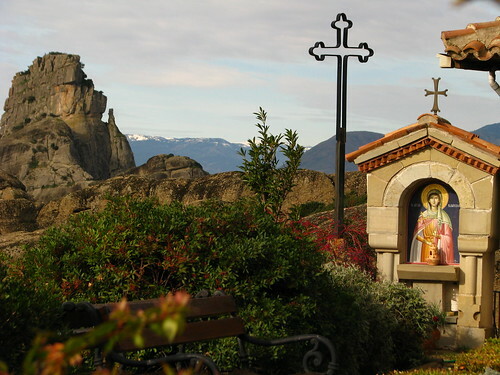 True to the spirit of Meteora, Greek Orthodoxy is characterised by silent asceticism, fasting and prostrations; practices very different from the modern rock concerts that we see in the US, Korea, Taiwan and Singapore. 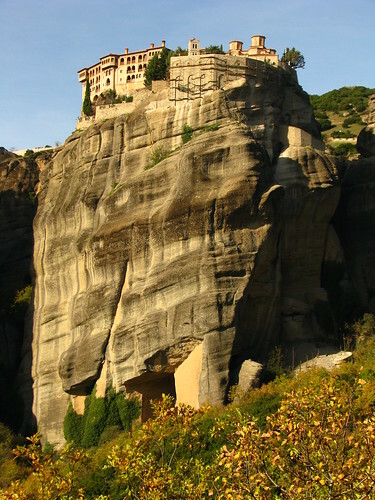 Believers at Meteora also engage in meditative practices, though not of the Yogic/Hindu type. On the stiff wooden chairs in the church, I saw monks reading the scriptures, immersed in a spiritual realm far from the pleasures and prosperity of the world below. Out on the balcony, you could see the plains below and the ridgeline of the Pindos Range punctuated with a number of snow-clad peaks. After seeing Agios Stephanos, we walked on the road which led us further and further from the rock towers. From the flat ground at the end of the ravine from which we ascended, the road continued its way back towards the rock towers. The ancients had a far more direct but rugged route. After bypassing the descending road to Kastraki, we made our way to Valaam Monastery. 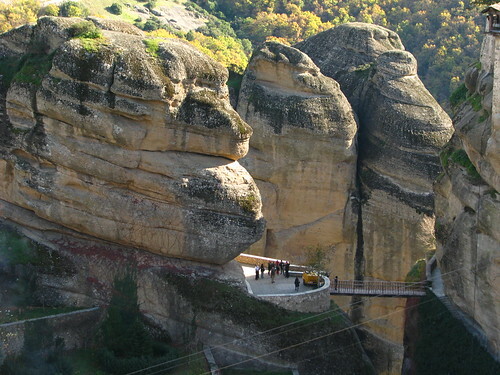 Before there were any bridges, this must have been one of the most inaccessible monasteries in Meteora. Even today, there is still quite a bit of winching going on here, especially when this monastery seems to be under heavy reconstruction. The murals inside the Katholikon here are much more worn and faded compared to those at Stephenos. There’s supposed to be an infirmary and hospice here, but most of the monastery has been cordoned off. What impressed me most was the gigantic wine barrel which made me wonder how much wine was needed to keep the ideologically displaced Greeks happy. Ideology aside, I certainly don’t mind partaking in this form of spiritual experience. We left Valaam and headed off for Megalo Meteoro – the grand monastery of Meteora. Unfortunately, the place was closed. The afternoon sun was getting more intense and temperatures began to soar well above 20 deg C. Since it was not my intention to bag all the monasteries here and the little guy was getting a bit bored by now, I decided to head back. We backtracked till we saw the descending road which pointed to Kastraki. 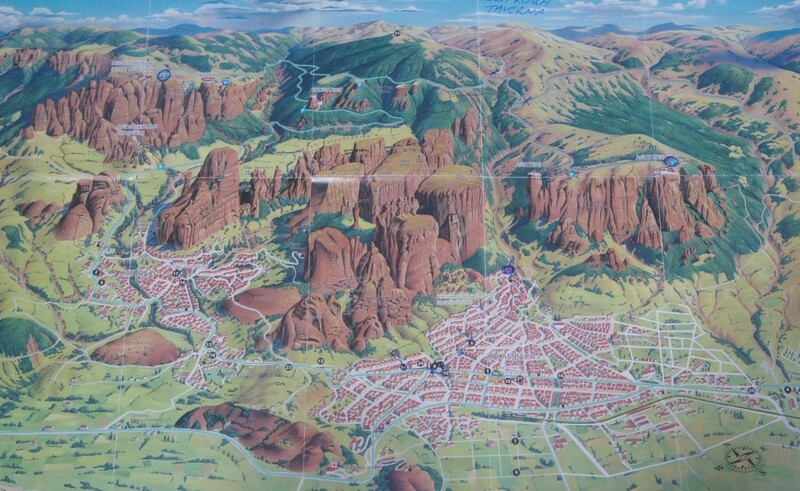 You can see Kastraki, illustrated as a cluster of buildings next to Kalambaka on the right in the map above. 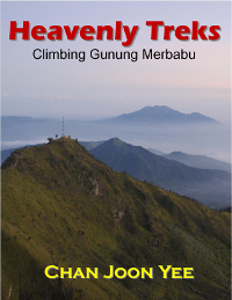 It was a long and gentle way down – much longer than the steep and rocky path we took on our way up. But the winding road brought us to the foot of two monasteries, Roussanou and Agios Nikolaos shown below. I decided not to climb up to find out if they were open or closed. The sun was low when we arrived at Kastraki and then the railway station at Kalambaka. We had walked 20km since 7.30am. After grabbing a drink at a convenience store, we went back to our hotel room to dump our stuff and wash up a bit. The water from the tap was ice cold as the heater had not been turned on yet. As the sun set, we headed off to a slightly more happening part of the town nearer the railway station and had some pizza and Mediterranean salad. We dropped by at a minimart and bought some snacks for the next day’s trip. I stumbled upon something familiar. 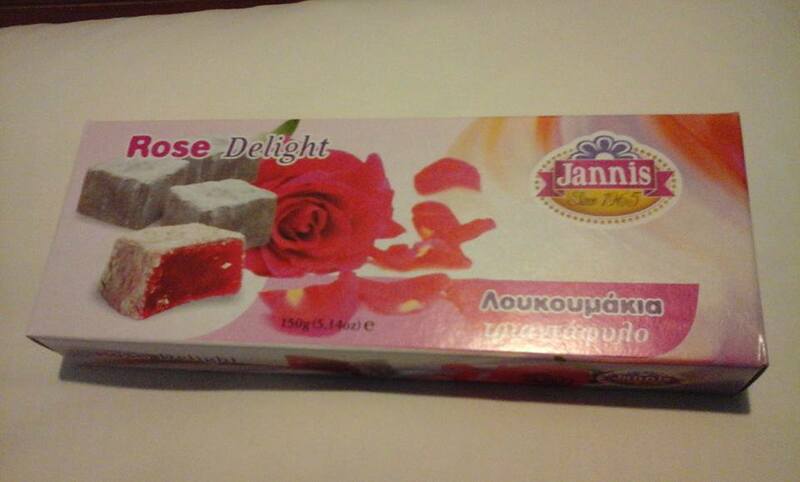 Way back in 1979 when I was in Sec 3, a classmate of mine who had a brother working in Athens brought home an exotic rose-flavoured snack. It was love at first bite. I liked it so much that I never forgot about it even though I didn’t even know its name. Now, when I’m in Greece more than 30 years after I first tasted it, I spotted it at a minimart. It felt more wonderful than a sense of deja vu. 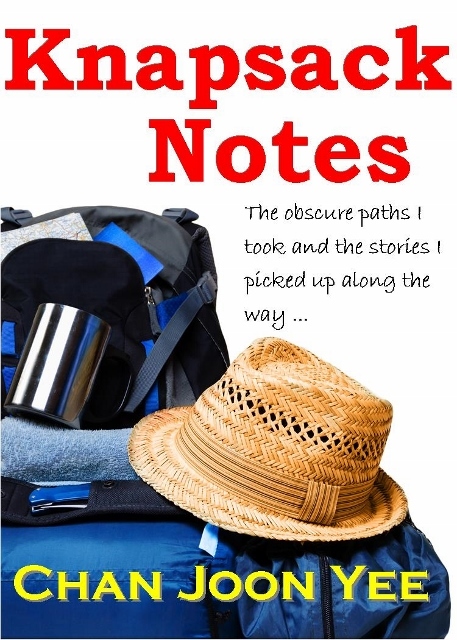 It was like finding the owner of a glass slipper I’ve been holding for 30 years. The snack is called loukoumi and I knew from that moment that we would never be apart again. Back at the hotel, Dimitris offered information on our next destination (which turned out to be quite inaccurate). 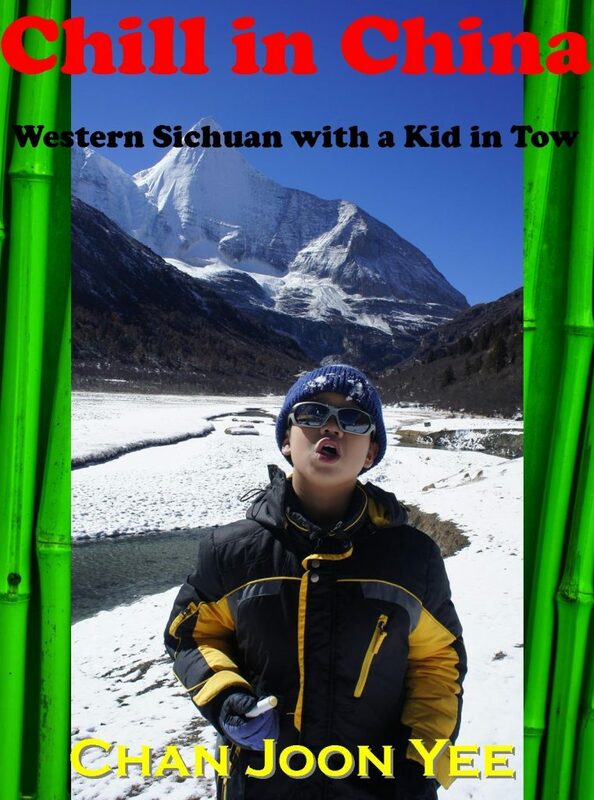 The little guy hadn’t had enough of trekking. He wanted to climb Mt Olympus. I was pleasantly surprised. Dimitris was eager to offer assistance. 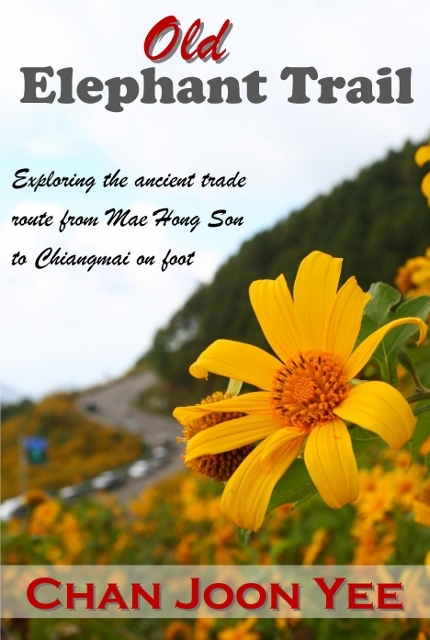 He gave us a brochure and told us we could contact his friend who was a guide based in Litochoro. 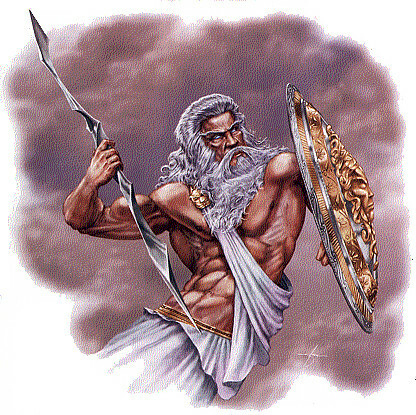 We went back to our room, enjoyed the warmth and comfort before we would face the throne of Zeus.